The World Series is quickly approaching, and I could give a crap this year who wins, cuz I hate all 4 teams remaining. But let's go back one week ago....56 year ago. If you don't want to do the math, I am talking Oct 8th, 1956. The only perfecto that really made a big difference. There are hundreds of ways the game has been remembered on cardboard - I just happen to like this one. So much that I bought it for $2 with shipping off eBay. Overpaid - maybe. But I didn't need that extra buck to supersize my meal anyway, so I think it was better spent. Fleer put out a simple card with a nice premise about the ballgame. It's a shame the box score isn't some pseudo reprint though. They do fake patches in the past few Topps releases, so step it up next time. 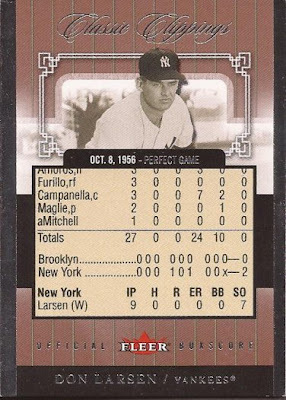 But I still enjoy this card, and serialed #878/1956 is nice too. One thing that bugged me - what are the 24 and 10 noting? It took a couple minutes of research to learn the 24 is the number of put outs for the player, while 10 is the number of assists. They don't show those stats in a box score very much anymore. And why 24? Remember this was a home game for the Bronx Bombers. All I can say about the World Series now is "Go National League." I agree, I don't like any of the teams, but I hate Detroit and the Yankees more. I was rooting for Baltimore and either Cincinnati or Washington to go. I like the underdogs, I guess.